Custom made to your measurements to ensure a perfect fit, these goat rugs have adjustable straps on the front, crossover straps under the belly, a tail piece and rear buckles for added comfort and fit. Available in Thermal or Waterproof. 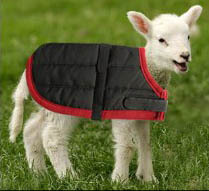 A thermal coat ideal for newborn lambs to fend off the elements. Fastened with velcro across the front and around the body. The Flectalon we use is made to Gillrugs own specification. The outer cover is extra tough shower proof nylon, and the lining is a smart poly/cotton mixture. Please note while it is great protection against light rain it is not waterproof.